Blizzard is officially looking to hire folks for a console port of Diablo III, but it won't officially announce a console version of the game. 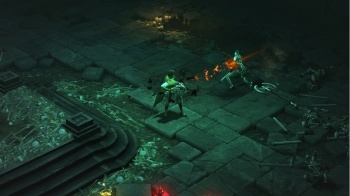 Over the past year, the rumor that Diablo III is coming to consoles has been drifting slowly into the realm of facts. Back in November, the developer admitted that it was considering bringing the game to consoles. Then, in June, a job posting specifically mentioned that the Diablo III team was working with PS3 game code. Now, Blizzard's admitted that it's "very, very serious about bringing the Diablo 3 experience to the console." "Today, we're trying to build the best console team at Blizzard. We're looking for programmers, designers, artists who think their dream job would be to bring Diablo to the console. Trust me, it is a dream job. "All I can say is it's going to be awesome. Stay tuned." Of course, Blizzard probably won't officially announce the game on any console system until the project is officially under way and it's happy with how things are progressing. That said, gamers should look at the game's overall progress with "glass half full" perspective: it's expected that an open beta for the PC version is due to start before the end of September.